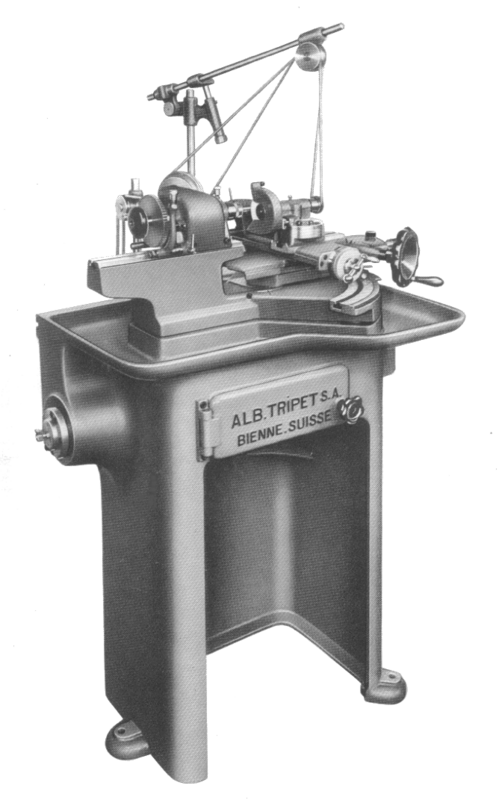 Best known for their internal grinders, the firm of Albert Tripet SA were based, like so many other famous Swiss machine tool manufacturers, in Bienne or Biel on the border between french and german speaking Switzerland (often known as the “Rosti Belt”). While the internal machines will probably be a little too specialised for the general tool-maker, horologist or instrument maker, the small MUS100 universal grinder and MHP/MHPE surface grinding machines will certainly be of interest. The MUS 100 was designed specifically for tool-making in the horological and instrument making sector. The machine consists of a work-headstock mounted on a prismatic bed which is part of a larger casting forming a semi-circular sector. Somewhat resembling a giant Schaublin 102 grinding attachment, the grinding wheel carriage can be positioned at any angle between 0º and 45º in either direction relative to the work-head axis. The carriage itself consists of a screw operated top-slide perpendicular to a rack and pinion operated longitudinal slide. The work-head accommodates W12 collets and is driven by round belt from a motor in the cabinet (or at the rear on bench mounted machines). A spindle nose-thread of Tripet’s own specification allowed the direct mounting of chucks (a Schaublin 70 nose thread was available to order). A special bed allowing the mounting of a Schaublin W20 headstock was available to special order. Various internal and external grinding attachments driven by round belt via an overhead belt tensioner were available. Mounted to the special prismatic bed section of the carriage top slide, the standard external grinding spindle could be rotated on a swivel base to achieve the perfect orientation of the wheel to the work-piece. Various attachments allowed the machine to be used for both internal and external grinding and also for tool and cutter grinding including controlled helical grinding. Of special note are the exquisitely designed and executed internal and external grinding attachments designated the AMI and AREA. Both the AMI internal grinding attachment and AREA external attachment featured hydraulically actuated automatic reciprocatio n of the grinding spindle. The hydraulic system including the hydraulic pump being incorporated withing the attachment itself was a superb feat of miniaturisation. 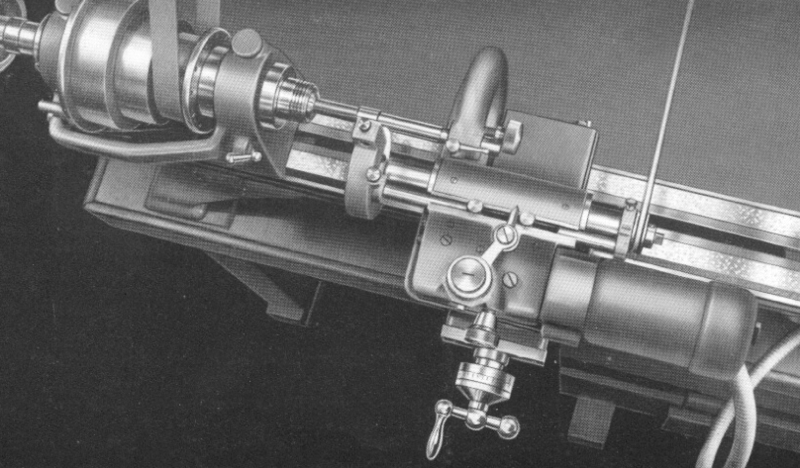 A simple hydraulic valve regulated the speed of reciprocation, while a lever operated reversing valve changed the direction of travel between adjustable stops. 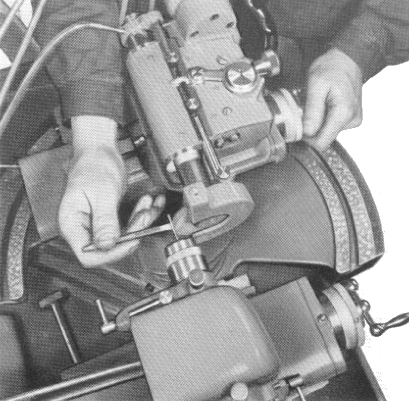 The AMI internal attachment featured a high-precision high-speed air-turbine spindle, with the hydraulic pump being driven by the overhead belt. In contrast the AREA external grinding attachment used the overhead drive-belt for the grinding spindle while the hydraulics were driven by an electric motor. Later versions of the AMI and AREA grinding attachments had their hydraulic reciprocation powered by a conventional hydraulic power-pack located in the base of the machine. The video below, kindly provided by Dr Andrew Cowie, show the features of two MUS100 machines. 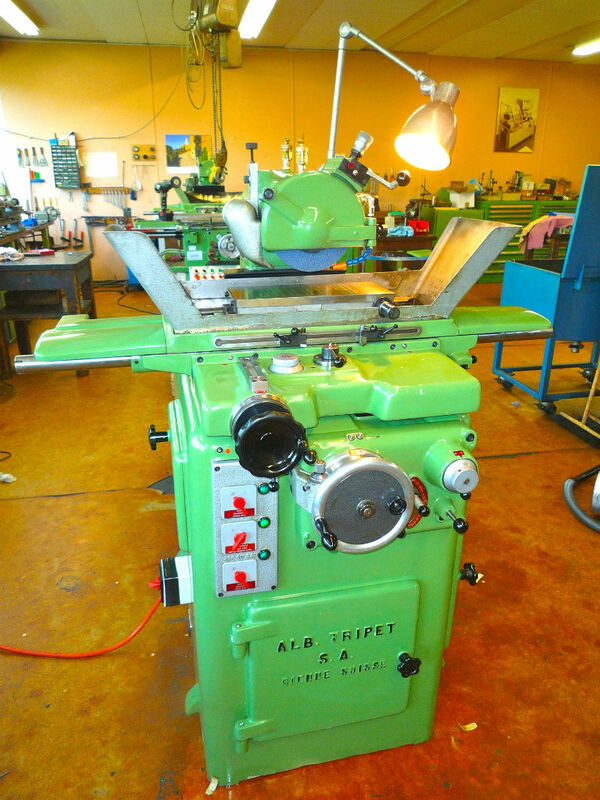 Of particular interest to owners of Schaublin 102 lathes is the AMI and AREA attachments specially designed to replace the top-slide on a standard 102 turning carriage converting the versatile 102 into a miniature high precision hydraulic cylindrical grinder. 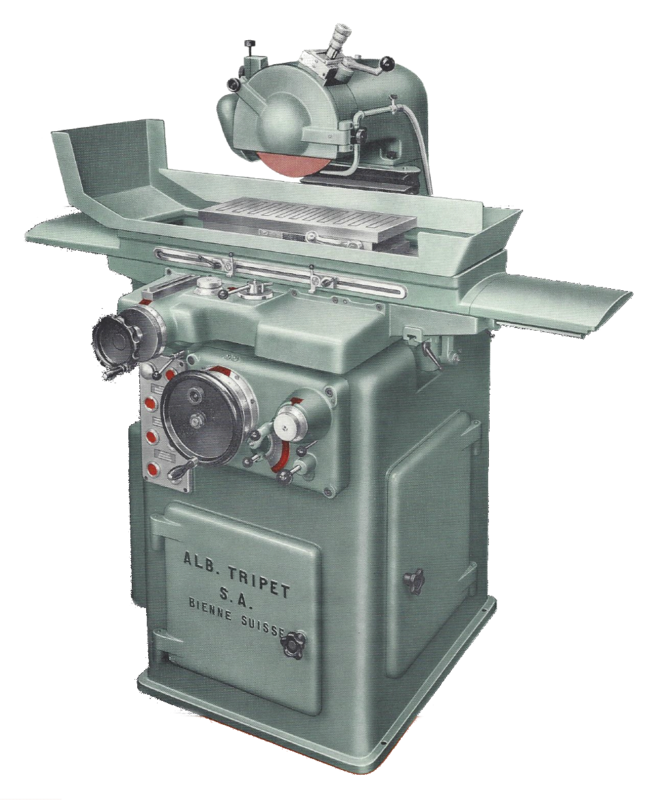 Produced from the late 1940s, Tripet’s MHP surface grinders were built to exacting standards with a claimed parallelism of better than 2 microns (0.0008″). Offered in two capacities: the MHP 350 with 350x180mm travels and the MHP 500 with 500x180mm travels, both machines were built upon the same substantial base-casting and shared everything except the grinding table and its associated hydraulics. 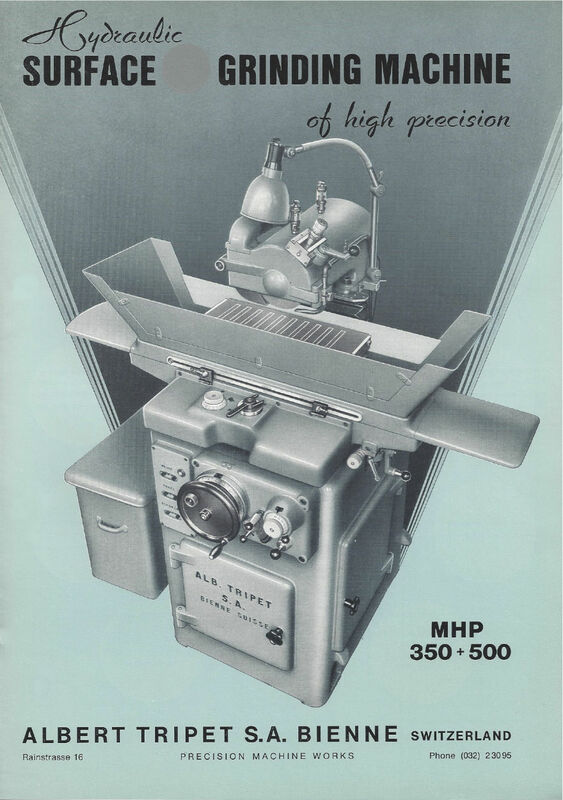 The MHP 350 was discontinued in the early 1960s and the MHP 500 was developed in a number of small ways including enlargement of the table travels to 530x230mm. Given a footprint of around 1m x 2m, these later machines are possibly the most compact surface grinders with a half meter capacity. While Jones and Shipman were producing the well respected 540 with a mechanically operated transverse feed, Tripet’s MHP surface grinders featured hydraulic longitudinal and transverse feeds. Utilising two separate hydraulic pumps driven from a common motor, the longitudinal and transverse feed systems could be operated entirely independently of one another increasing the flexibility of the machine. 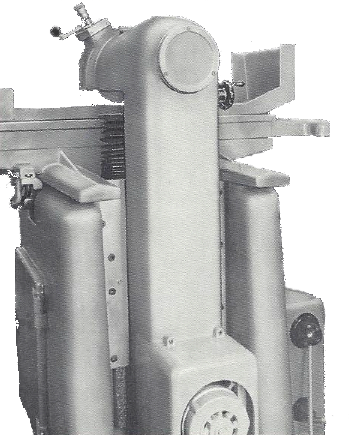 This also facilitated the use of the “criss-cross” finish grinding technique during which the x and y feeds are set to approximately equal (and relatively low) speeds allowing the wheel to pass over the work in a criss-cross pattern, greatly improving finish and accuracy. One unique feature of the machine was a device to stop and lock the slides via one lever. Pushing home a knob (located just below the transverse feed rate dial) in an emergency, or in order to inspect the work, stopped and locked both slides simultaneously. The cartridge-type grinding spindle consisted of a long tapered plain bearing at the front and ball races at the rear. 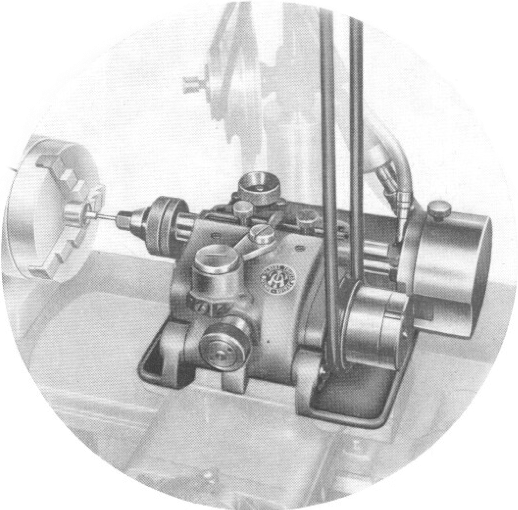 On early machines the spindle was lubricated with drip feed oilers, but later MHP 500 machines featured a recirculating and filtered pressurised lubrication system. A wheel-head mounted dressing device avoided the removal of the workpiece from the machine and a clever device (ordered as an optional extra) compensated for the reduced diameter of the wheel. The spindle was driven via flat belt from a 2.5 hp motor mounted at the base of the vertical slide. The arrangement of the wheel-head and motor relative to the vertical axis was such that the vertical column was well balanced, and being supported in long rectangular guides was both rigid and durable. A large handwheel with equally well-proportioned micrometer dial on the front panel controlled the elevation of the wheel-head. A mechanism was provided to automatically downfeed the wheel in adjustable increm ents (0.01 (0.005 later machines) – 0.10mm) at each reversal of the transverse stroke of the table. At the completion of the predetermined downward movement the feed automatically disengaged (see video below). As standard machines were supplied without a screw feed to the transverse slide. However, it was possible to order the machine with a precision lead-screw which could be engaged for precision positioning of the table in preference to the hydraulic feed. The majority of machines were ordered with the feedscrew and it is unusual to see used machines without it. In the 1970s, the MHP 500 was succeeded by the MHPE 500. The MHPE 500, while clearly owing its genetic lineage to its antecedents, was an entirely new design with powered vertical slide and external hydraulic power pack. Following the fashion of the time, the machine design was squared-up, and consequently, in my opinion, became much less elegant and visually attractive. 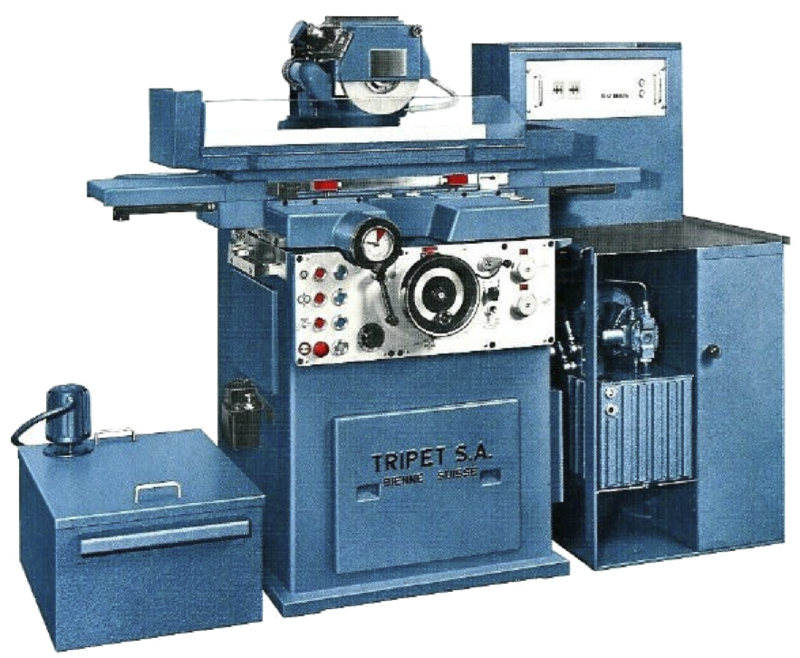 According to Tripet’s records, only 600 MHP and 470 MHPE machines were made. Most were for domestic consumption with only three MHP machines sold into the UK: one to the Admiralty; another into the aerospace industry; and one to a precision gear manufacturer. All three machines were supplied during the 1960s when the British economy was booming, defense spending was high and, critically, the pound sterling was at its greatest international strength – with an exchange rate of a now unbelievable 12 Swiss francs to the pound! A further three MHPE machines were sold to UK firms during the 1970s, when although British manufacturing was under stress, the UK was still a significant manufacturing nation and, although falling in value, sterling still commanded great international purchasing power. 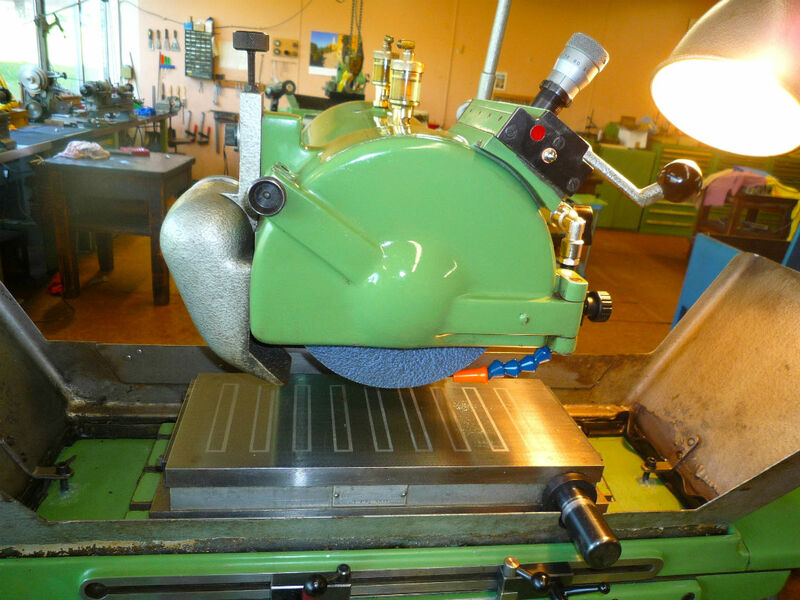 Beautiful MHP350 at the workshops of LKS Grinding in Switzerland. The machine is now in the UK.